Mr. Kaelber became the college’s first president in 1970 and led the institution for 12 years. According to its website, the college was founded in 1969 with a mission to use human ecology as a guiding, interdisciplinary approach to education. Darron Collins, a 1992 alumnus and president of the college, said Friday in a phone interview that Mr. Kaelber’s ideas and initiatives laid the foundation for the college as it exists today. 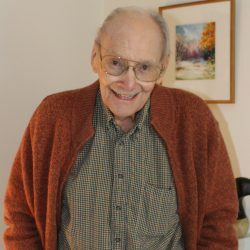 Mr. Kaelber lived in Bar Harbor for more than four decades. He remained an active part of the college community long after retiring as president in 1982. Collins, who took the helm of the institution in 2011, said he turned to Mr. Kaelber for guidance many times over the years. Collins said his ideas were timeless. Mr. Kaelber went on to found the Maine Community Foundation in 1983. A story posted on the foundation’s website said Mr. Kaelber, along with the late Marion Kane, set out to bring leaders from across the state together to improve the quality of life for all Mainers. The foundation started with a $10 gift from New York businessman Robert Blum, and has since grown to assets of an estimated $530 million. Mr. Kaelber was married to Patricia Kaelber for about 42 years. He later married Anne Sewall, who died in 2015. Mr. Kaelber was remembered by his family Friday as a loving husband and father who simply wanted to make a difference in the world. Christie Lee of Charlottesville, the oldest of his three children, said she admired her father’s courage to put into action the things he felt were important, such as education and helping Maine businesses grow. Mr. Kaelber had a passion for the outdoors and enjoyed fishing and canoeing.